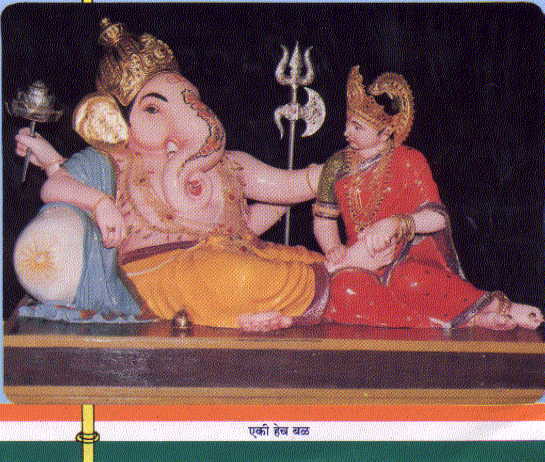 THROUGH THE MEDIUMOF GANESHOTSAV THE MANDAL HAS STIRRED UP INTO ACTIVITY, AWARENESS OF RELIGION AND UNITY. THE MANDAL HAS ALWAYS BEEN IN THE VANGUARD OF AROUSING RELIGION, ITS SPREAD. THOUSANDS OF PEOPLE FROM ALL OVER THRONG TO OFFER THEIR WORSHIPS AND ABHISHEK TO LORD GANESHA. THE MANDAL PERFORMS THE KAKAD-ARATI, DAHI-HANDI AND ARRANGES FOR FREE MEALS TO VARKARIS (DEVOTEES) OF DNYANOBA-TUKARAM PALAKHI.IT ALSO CELEBRATES THE IMPORTANT NATIONAL FESTIVALS SUCH AS 15TH AUGUST, 26TH JANUARY AND MAHATMA GANDHI JAYANTI. THE MANDAL ALSO RUNS THE SUBSIDISED FOOD CENTER ZUNAKA-BHAKAR-KENDRA . THOUSANDS OF PEOPLE FROM LOW INCOME GROUP TAKE ADVANTAGE OF THIS CENTER. IN ALANDI MANDAL HAS ESTABLISHED DHARMASHALA FOR THE BENEFITS OF DEVOTEES. 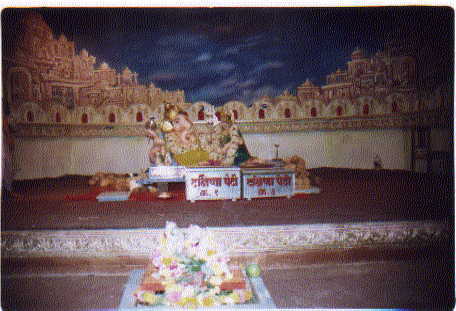 THIS YEAR THE SCENE ERECTED IS AN ART-TEMPLE IN WHICH DEITIES OF NATARAJ,SARSWATI, AND TRIMUTRY SYMBOLISING DANCE, MUSIC AND SCULPURE ALONG WITH LORD GANESH AND SHARADA REPOSING ON A SWING.THE SCENE IS ERECTED ON A DIAS OF 50FT.X40FT. IN A 50FT.X80FT.HUGE PENDAL.